A few days ago we created Paint Chip Valentine's!!! (I have a thing for Paint Chip Projects if you haven't noticed yet!) We've been getting into the spirit of Valentine's Day by putting up our Heart decorations and by making Snowy Hearts. C was super excited to get our Valentine making underway since we just took down our X-mas decorations last week. To create the hearts on our cards we used a mixture of construction paper and paint chips (paint samples). We began by cutting a zillion hearts! We folded our papers and I drew a half of a heart so that my daughter could easily cut them out by herself. We glued the cut out hearts on our blank cards. I happened to have some red, purple, and white blank cards, but you could use folded construction paper too. I talked about overlapping and arrangement of the hearts before actually gluing. C seemed to grasp the concept most of the time. Here are some of our finished cards. I love how they look!!! The next day we added some Metallic Markers to our Valentines for an extra special touch! We used these metallic markers on our Spin Art Valentine's from last year too. Stay Tuned for more Heart and Valentine related posts! 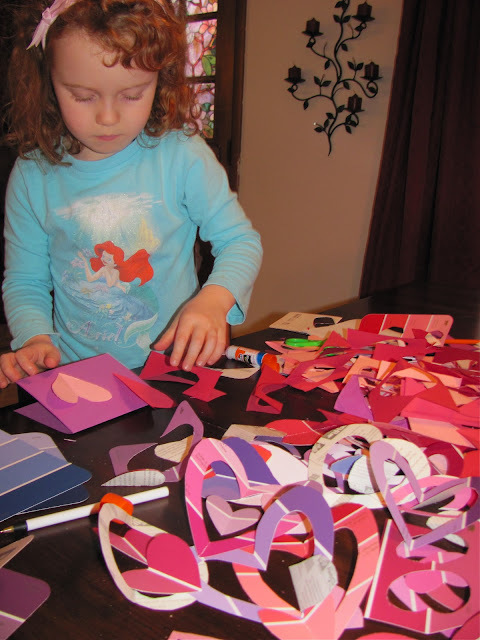 What kinds of Heart/Valentine projects have you and your children been working on? Awesome post, thanks so much for sharing this with us. The Chocolate Muffin Tree Is One Today! Paper Bag Puppets Inspired by Fandango!!! An Experiment in Making Snow!